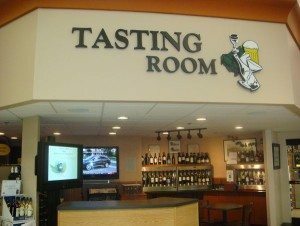 Visit Colonial Spirits of Acton’s wine tasting room! In our state-of-the-art wine tasting room, you can sample wine in a relaxed atmosphere. Try some samples. Sit back and watch a sporting event on our giant flat screen television. Talk to our wine experts. Colonial Spirits has weekly wine tasting events, where distributors, wineries, and producers stop by to pour new and exciting wines for our customers. In addition to our frequent wine tasting events, we always have 24 bottles of wine (15 Red and 6 White) available in our enomatic wine tasting machines for you to taste at your leisure.